Exercise can be especially beneficial if you have diabetes, helping to manage blood glucose levels, and prevent diseases to which people with diabetes are often more prone, such as heart disease. However, there are some things to be kept in mind when exercising if you have diabetes. Get proper medical advice before embarking on a new exercise-training program. Your health-care professional will take into account your general health and any complications you have from diabetes when advising you of a suitable program. For example, if you have loss of sensation in the feet, you may be advised to avoid any weight-bearing exercises, such as jogging, that might cause skin ulcerations or small fractures that you might not notice. You may be advised against lifting heavy weights if you are an older adult or someone with long-standing diabetes because it can dramatically increase blood pressure. 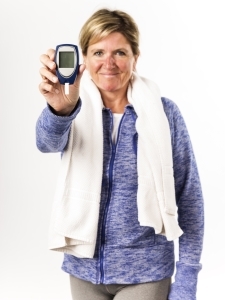 Monitor blood glucose levels before, during and after exercise, especially in the early stages of exercise training. Check twice prior to exercising; 30 minutes before and immediately before. If your blood glucose level is 400mg/dL or higher, do not exercise. Do not exercise when you are sick. Exercising when you are sick can make your blood glucose levels fluctuate dramatically and it may take longer to get well. Keep fluid levels well up before, during, and after exercise, especially in warm weather. Dehydration can affect blood glucose levels and heart function. Wear appropriate footwear. Peripheral vascular disease is relatively common in people with diabetes and often affects the feet.